Developers and property agents reported slower home sales last week following National Development Minister Khaw Boon Wan’s cautionary remarks on his blog. However, seller in the primary and secondary marketing are said to be remaining firm on pricing. Some property consultants estimate that developers’private home sales in May – the official number from URA will be released tomorrow – may come in close to the level in April, when they sold 1,788 private homes excluding executive condos. The project in Hougang, which has been on the market since May 21, is said to have seen sales in the single-digit last week, compared with about 20 units in each of the preceding two weeks. 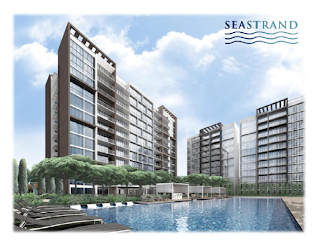 The five-storey, 99-years leasehold project is priced at about $950psf on average, with about 210 of the total 414 units now taken up. Far East Organization is said to have sold over 80 units at its Woodhaven condo project in Woodlands. The average price is said to be over $900psf. The 99-year leasehold project has three components – regular apartments; soho-style apartments with greater floor-to-ceiling height; and townhouses. City Developments Ltd has sold 17 out of 25 units released at its 64-unit Buckley Classique between Friday and Sunday. The early-bird average price for the private preview, which began on Friday, was $1,950psf. Lump-sum prices are said to range from $2.27 million for a 1,098sqft, two-bedroom apartment on the second storey to $7.1 million for a 4,359sqft penthouse with five bedrooms and a family area. The freehold development comprises two blocks (five and six storeys) on the former Buckley Mansion at No 11 Buckley Road and will incorporate a conservation bungalow next door (No 9 Buckley Road) for use as a club house for the project. 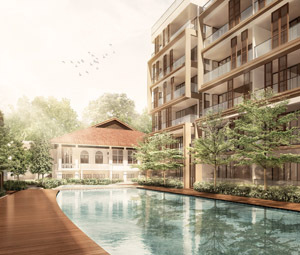 This project in Pasir Ris by Far East and Frasers Centrepoint is said to be garnering strong interest. The average price is said to be about $850psf and sales could begin as early as later this week if all the requisite approvals are secured in time. The 473-unit project will have one to four-bedroom units. • It’ll be interesting to see what the June private home sales number will be like. • Developers seem to be launching new projects with a vengeance these days – is it really due to strong demand, or are they also concern that the “bull run” on property prices may come to end soon? 1 comment to ''Home sales slowed last week"
The question is...will QE2 really cease or will it continue? We know that it has been reported USA's economy is still in dire straits. Warren Buffet put a "buy" on this economy and yet it is still not roused from its slumber as yet, so says news reports. The question is, will Singapore property still be a good hedge against inflation? Or does Min Kor know something that we dont and is not telling? Some time back last year, for those who remember, it was said that Singapore aims to be a Data Hub...who are gonna fill these knowledge positions? Will our population growth be on target? Is the supply good enough?